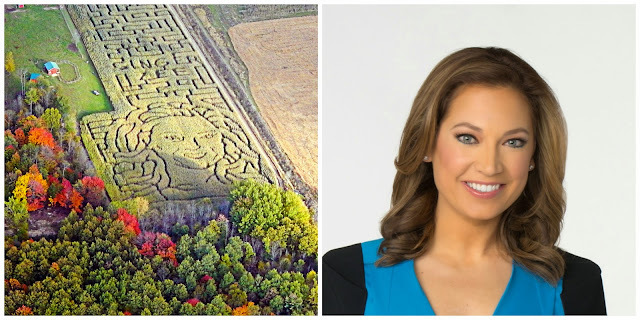 In 2014 we asked Ginger Zee, the Chief Meteorologist from Good Morning America if we could put her face in our corn maze. She graciously accepted and we ended up with this beautiful maze. 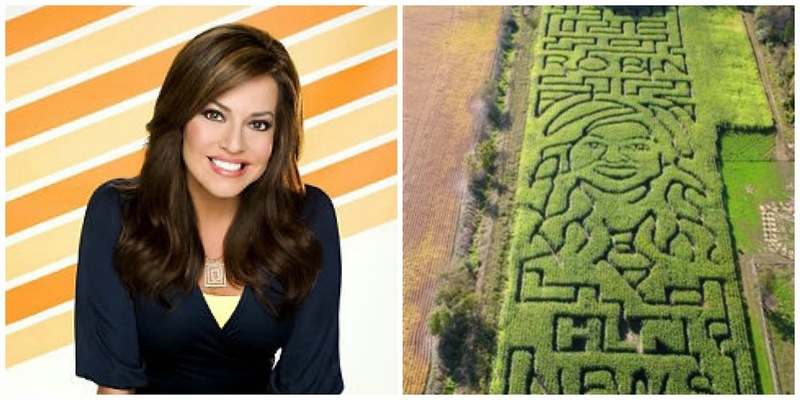 We first started featuring celebrities with Robin Meade, lead anchor from Morning Express with Robin Meade on HLN. When we asked her via Twitter her publicist team immediately responded and said they thought it would be hilarious and agreed. Robin was so nice and even sent us an autographed picture and called to thank us for putting her in the maze. My dad was on cloud nine, as it was his idea to ask her. We had to hear about how it was his idea for a while. Here is the picture we used to make the maze, and the actual maze. I think we did pretty good. From there we were questioning who to get in the maze? 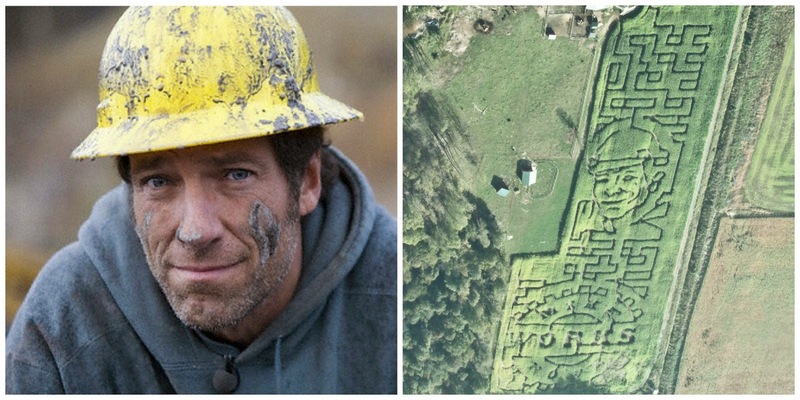 We decided to ask Mike Rowe from Discovery Channel's show Dirty Jobs. We tracked down Mike's agent's contact info, which turned out to be a former agent, but he was super nice and forwarded it on to the new agent who called me to get some more details. After explaining our request, Mike's agent laughed and agreed. Mike Rowe is very passionate about skilled trades and the lack of skilled workers in the United States. He stared a foundation called Mike Rowe Works lobbying for skilled trades, and raising funds for skilled trades programs. We honored this by hosting a skilled trades day at the pumpkin patch inviting local unions and building programs to have informational booths. It was a lot of fun! The following year, 2012 my Grandmother turned 90 years old. We thought, what a better way to honor her than putting her in the maze. 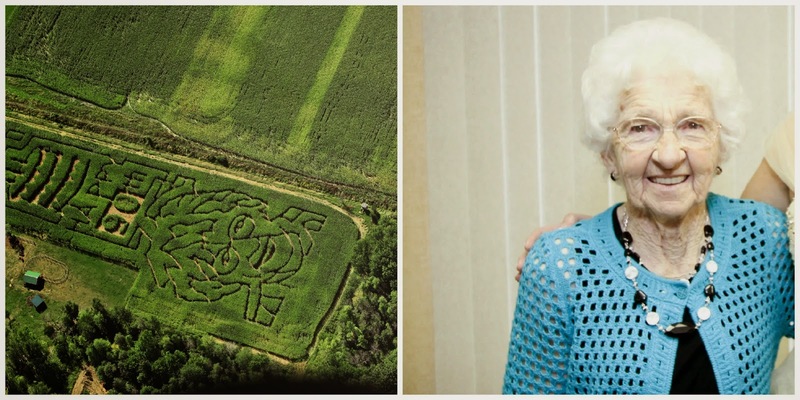 So all summer we kept the maze design a secret from Grandma and waited until we had pictures of the maze to show her that she, herself, was the maze design. She was stunned and shocked, and a little embarrassed because she was a very modest person. It was a fun happy birthday theme for Grandma to celebrate her pumpkin patch and birthday. From there we were stumped as to who to ask to feature in the maze. After a lot of thought we decided to start featuring Michigan natives. People who really appreciate our great state, and asked comedian Tim Allen. 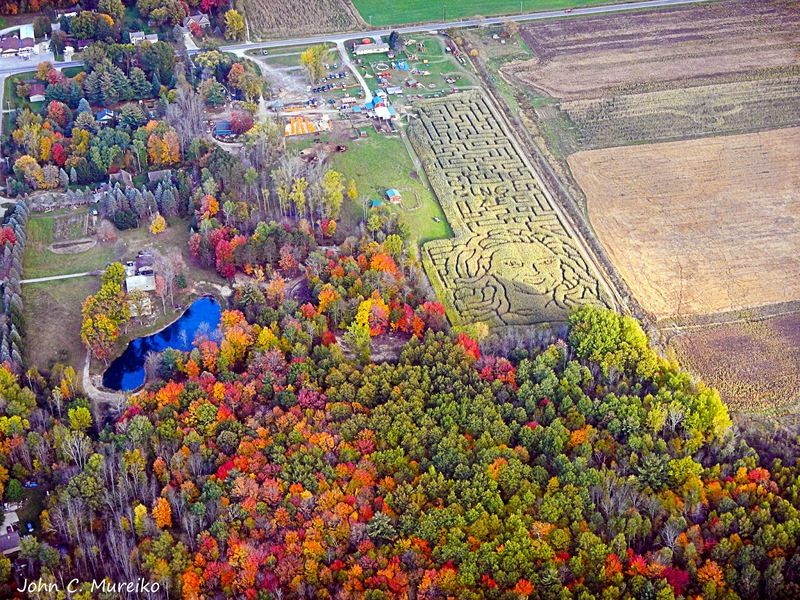 Tim's publicist was awesome to work with, and thought it would be a great idea to put him in our corn maze. She said Tim only had one request, that his corn maze have more muscles than Mike Rowe's. Turns out they are friends and Tim checked out our other mazes before agreeing to appear in it. 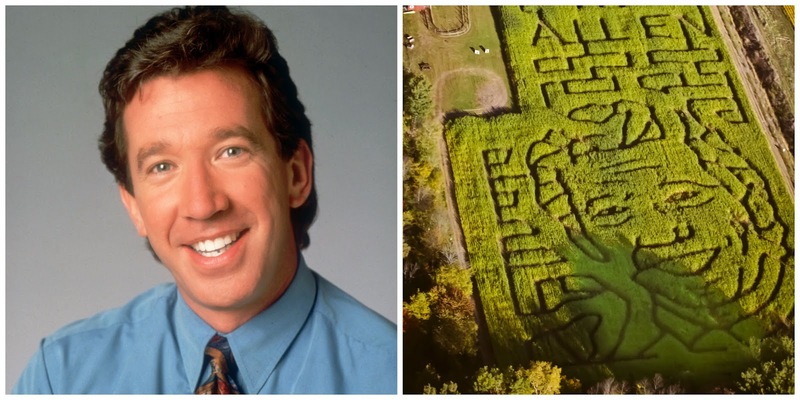 So I think we did a pretty good job of putting Tim in the maze. In 2014 we asked Ginger Zee because she had ties to the area. Ginger graduated from Rockford High School in Rockford, MI. After graduating Valparaiso University with a Bachelor of Science degree in Meteorology, Ginger worked at a local Great Lakes Bay area TV station, WEYI TV25 in Flint. From there she went on to work at WLAV-FM and WOOD TV, both in Grand Rapids. The really funny part is, I lived in Midland when she was on WEYI and lived in Kalamazoo when she was on WOOD TV, so I saw Ginger on both stations. In 2013 Ginger was named the Chief Meterologist for Good Morning America, and has been on the morning show reporting ever since. Ginger was married in June of 2014 in Petoskey, MI and used mostly local vendors and Michigan companies for her wedding items. Ginger technically was born in California but grew up in Michigan and continues to support our state. If you want a great Instagram profile to follow to keep up on the weather, the fun adventures she has on Good Morning America, and pics of her dog Otis, check out Ginger Zee's profile. Another way to see what Ginger is up to is to check her YouTube Channel, Weather or Not. The channel is self described as "“Weather or Not” is a channel that lets the YouTube viewer choose whether to watch ABC News' most extreme storm coverage or other daily adventures with Ginger Zee, from polar vortexes to plane jumping." Ginger is very busy, and is continually growing in popularity. We asked Ginger if we could use her face in our corn maze, and she said she would be flattered. She was very kind, and always answered any questions we had. What do you get a person that has been on awesome adventures, and lives in stylish New York? There is really nothing we can get Ginger to say thank you enough, but we tried. 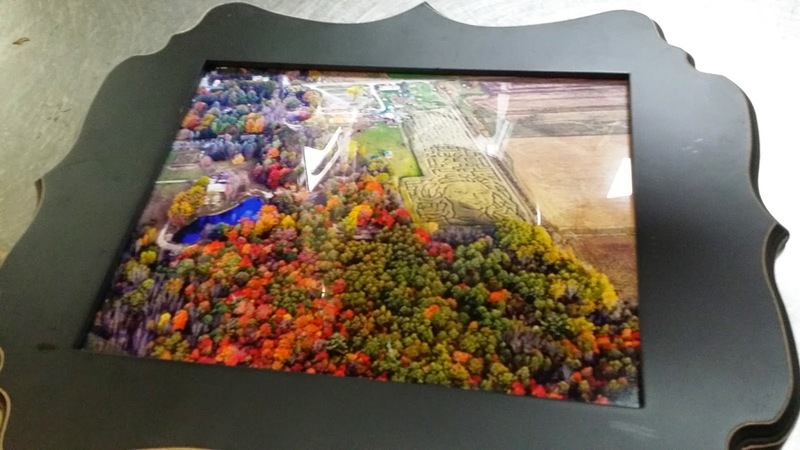 I framed a photo of the maze, sent a Grandma's Pumpkin Patch tshirt for both her and her husband, and threw in a few dog bones for her dog Otis. Thank you Ginger for being such a great representation of the state of Michigan! 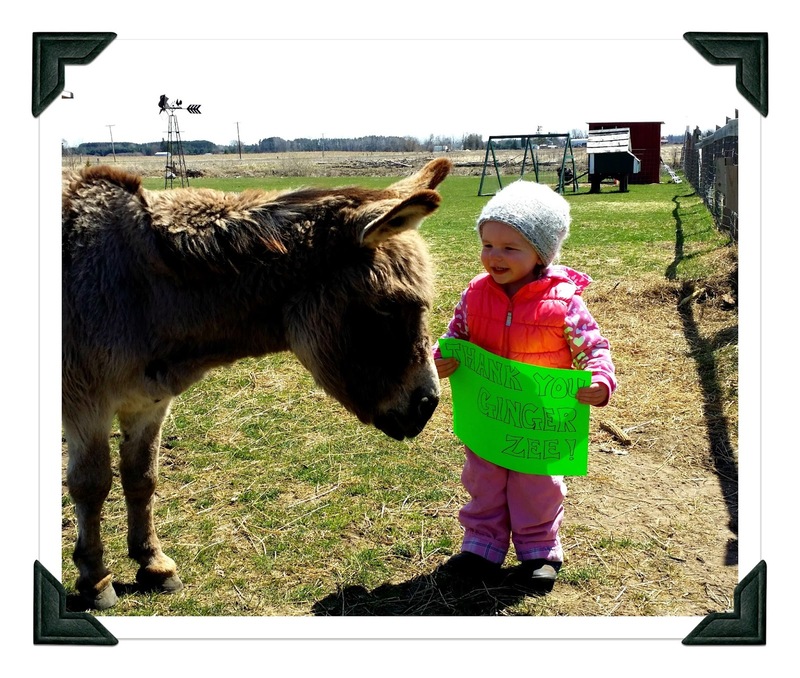 Ella and Tony the Donkey say THANK YOU!